So this weekend we had to head down to Columbo, Sri Lanka’s capital, to get our visa’s extended. After a 5 hour journey we finally arrived at the immigration office, a 3 hour wait and our visa’s were sorted and off we headed to Negombo to see if we could go to the beach and catch some sun. The traffic leaving Columbo was crazy, although, it was interesting to see the difference in the capital compared to the rest of Sri Lanka, there were big chains such as McDonalds, KFC, Burger King and Dominos. It made me realise how much I like the North where I have been carrying out my placement; with only small market shops and 1 main supermarket, a Sri Lankan brand. No big chain stores or busy traffic compared to the capital. We finally arrived in Negombo 2 hours later. A few issues arose with our hostel but after some food and a cocktail on the beach we could finally relax and enjoy our evening as 2 of the girls were heading off to the airport the next day to continue with their travels. 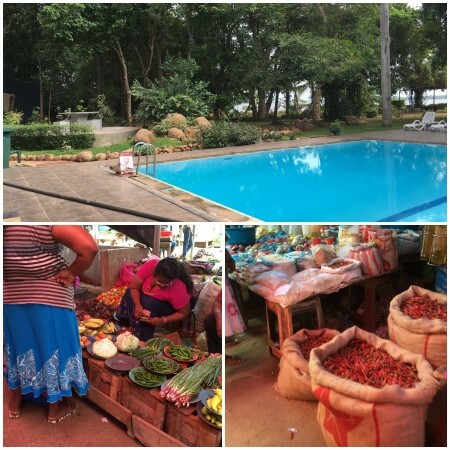 We all had a slight culture shock between the different attitudes of the locals in the south compared to where we are staying in the North Province of Sri Lanka. 3 different buses and 6 hours later we arrived back at the Work The World house. I have to say the local buses in Sri Lanka are quite an experience to travel on, scary at times due to the way they drive: under cutting and over taking each other. But overall a fun and very cheap way to see some of the rural areas of Sri Lanka! This morning we headed to one of the pools in a nearby hotel to chill after the days of previous travelling. The pool was very relaxing and you could look out over a nearby lake while monkeys played in the surrounding trees. This afternoon we went to a local market in the town centre and experienced the real way they trade goods and barter with each other. In the market there was such a variety of veg, chillies, spices and fish being traded and the place was bustling. Two new girls are arriving this evening and then we are back to placement tomorrow.